If someone wants to take the place of the only mediator between God and man, he has to position himself quasi as mediator-mediator and take over some qualities and tasks which actually lay entirely with the mediator. In order to make Jesus Christ for the people, a well-founded calling must be constructed, which must be made clear to the people again and again and with emphasis. At the same time, the original and only mediator between God and man, Jesus Christ, must be denied one effect after the other, so that there is enough material left in which the new mediator can clothe himself. The limitation of Jesus' saving effect to the 144,000 so-called anointed Christians (leading body of Jehovah's Witnesses) is such a blow to the office that it is intended to deprive the work of Jesus of his absolute perfection. The very term "anointed Christians" is in itself a mockery, for there are no two kinds of Christians. When Jesus spoke of the other sheep, he pointed to the origin of the other sheep and not to another direction. Jesus concludes his announcement that he had other sheep to bring, with the clear indication that it would be one flock and one shepherd. With the division of Christians into two groups, the Watchtower Society not only lays the root for a great chaos of thought that helps it to enforce the most abstruse special regulations, but it also consciously circumcises Jesus Christ himself, who never in the slightest hinted that there would be two kinds of saved people. On the contrary! His promises (e.g. : Whoever believes in me will not die, even if he dies) are always so general that it is an insane undertaking to accuse him of the authorship of a two-class society. But this is exactly what the Watchtower Society is doing, and besides the division of the Christians it has in mind the much more important goal for them to present Jesus as someone who needs the support of an earthly organization. Satan prefers nothing more than a Christ who lacks a foot, a hand or even a few thorns from the crown of thorns. Therefore, all the teachings that represent Jesus with gaps and small mistakes are cheeky attacks of Satan on God's Son, who not only brought about the salvation of men in an absolutely perfect way, but is also entirely responsible for leading and protecting the believing man and placing him before the face of the Father. Every teaching that takes something away from Jesus, even if it is only a minor matter, is an attempt to put Jesus at a disadvantage as Saviour of all people. The Watchtower Society often likes to portray Jesus as a figure whose negative appearance makes a true Christian shudder (example). The aim of this exercise is to infiltrate the human brain with the idea: Jesus was a great guy, but can never be God. In the Watchtower Book "RECOGNIS, Which Leads to Eternal Life" the faithful and discreet slave on page 67 shows a Jesus who also lacks something. The blood! If you get a nail hit through your wrists, you don't have to bleed as long as you can stand the pain silently. 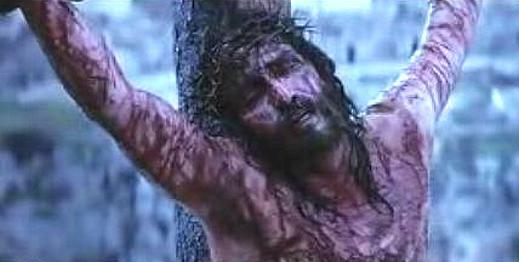 However, as soon as he hangs on this nail and his body weight pulls him down, blood must come out of the wound. But the Watchtower Jesus simply does not bleed! He is bloodless. And it is exactly this bloodlessness of Jesus that the henchman of Jehovah, the Watchtower Society under the leadership of the faithful and intelligent slave, proclaims. This bloodlessness of Jesus symbolizes precisely the goal of the Jehovah's Witness doctrine, which Jesus wants to see as an insufficient sacrifice, as a non-God and as a king who uses an earthly organization to realize his goals. Without making Jesus imperfect, the authors of the desecration of the Bible would have no means of standing between Jesus and men. This unmasking bloodlessness, the true meaning of which even goes so far as to portray Jesus as a zombie-like (in)being, is the basis of the self-appropriated mediation of the Watchtower Society. And as a sign that Jehovah's Witness really has fallen for this bloodlessness, he must let bread and wine pass by in the Anti-Cenacre meal celebrated annually. It is indeed the case that the Lord's Supper celebrations of Jehovah's Witnesses are a single great demonstration that the Blood of Christ has no validity or effect for Jehovah's Witnesses. But by what are these witnesses saved, if not by Jesus? Yes, right! Through the Watchtower Society! How could this Jesus also be able to save people when he is marked by the faithful and intelligent slave through an animal head as a senseless enterprise of God? The Jesus of the Watchtower Society did not really have to endure and bear what the Jesus of the Bible did for us. The Watchtower Jesus did not get a scratch. This representation shows that the ideas and teachings of the Watchtower Society are pure fiction. They are vehicles that are supposed to oppress people and make them servants, and they are techniques that diminish the glory of Jesus and, in this context, are to be absolutely associated with the authorship of the adversary. The Jesus of the Bible, who true Christians experience and whom they serve and follow, this Jesus does not come into your life as Jesus streaming with blood, but meets you as a Redeemer, a Deliverer and as someone who accepts and loves you. This Jesus, who is directly at work in the heart of every person who believes in him, is faithful and just and leaves no one in the dark. He lets himself be asked and rewards the request to him with hearing, consolation, fulfillment, yes! with life. He who comes to him will not be expelled, neither by a legal committee, nor by bullying. The one who entrusts himself to Jesus will come from the springs of living water, which spring up to eternal life. This Jesus, who wants to meet us today, has done in his time as man "a thing" that is unique in the world. The mere fact that man is not to be saved by modesty and honesty, but by faith in the exalted Christ, can only be attributed to the love of God, who should have destroyed us all because we have sinned against him and men. Because of the perfect righteousness of God, there is no imaginary, theoretical way of grace, but the righteousness of God must be fully satisfied. This is what God Himself took upon Himself in Jesus. God Himself pardoned us all and left Himself on the cross. The self-expression of God on the cross is the thing that no one can comprehend with his brain until he finally says to Jesus: Lord Jesus, be my Lord! 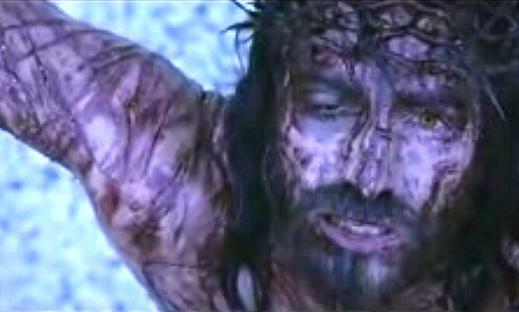 To illustrate the reality of what Jesus did for us, some pictures from the film "The Passion of Christ" follow. If you really want to judge whether Jesus hung on the stake without losing blood or not, you should watch this film. Everyone should wish to know what Jesus really did for us. Jesus Christ actually erased the entire sin of the world. There is no other mediator between God and man except him. The Bible says that he was maltreated for what we piled up before God in guilt. 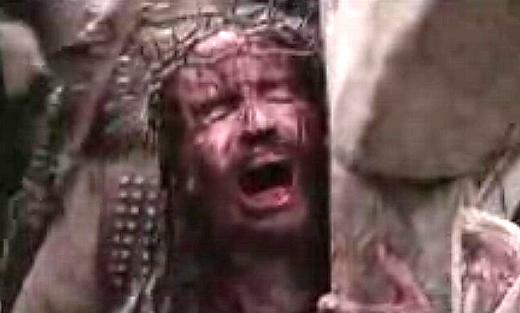 Jesus' deniers portray him as one who looks more like a civil servant who has just fallen asleep on his office chair. And again, there is not a drop of blood that could come from the Watchtower Jesus. The Watchtower sells a wax doll as Jesus. The stab wounds on the wrists remain without blood. Even the worst plagiarism producers in China would do that differently. This tells us that the bloodlessness of the Watchtower Jesus is wanted. One recognizes in the chest area of the bloodless WT-Jesus-Zombis again a strange figure. Please click on the picture.